RED FASTER has been precisely balanced to provide the most effective energizing substances, vitamins and minerals. All ingredients have been selected to meet the body’s specific requirements during strenuous and prolonged training. 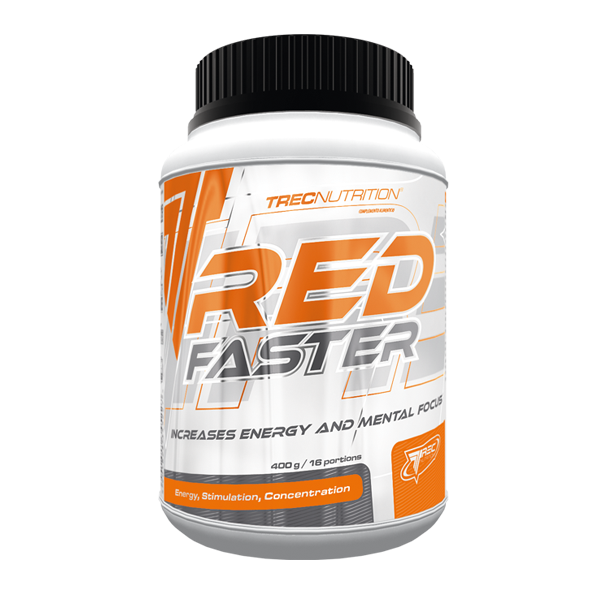 RED FASTER stimulates, improves concentration and reaction speeds, and delays the onset of fatigue symptoms. RED FASTER is recommended for high-performance athletes and people engaging in intensive physical and mental effort. Dissolve a single serving of the product – 25 g (5 scoops) in 300 ml of water in a shaker. Depending on your needs, take 1–2 servings daily, preferably before breakfast and 30 min. before the workout. Please note: Do not take before bedtime! WARNINGS: Do not exceed the recommended daily dose. Do not use the product as a substitute for a varied diet. Children, pregnant or nursing woman must not take the product. Varied and balanced diet and a healthy lifestyle are important. Do not use the product in case of circulatory system problems or sensitivity to caffeine. Do not combine with alcohol! The product may contain allergens such as: milk, soy, wheat, barley, oats, eggs, peanuts and nuts. INGREDIENTS: FAST Energy System [maltodextrins; saccharose; taurine; L-tyrosine; inosine; L-carnitine tartrate; caffeine anhydrous; inositol]; ELECTROLYTE Refil [sodium citrate; calcium salts of orthophosphoric acid; sodium chloride; magnesium salts of citric acid; potassium citrate]; silicone dioxide – anti-caking agent; citric acid – acidity regulator; POWER Vitamin Blend [vit. C (L-ascorbic acid); niacin (niacinamide); pantothenic acid (calcium D-pantothenate); vit. B6 (pyridoxine hydrochloride); riboflavin; thiamine (thiamine mononitrate); folic acid (pteroylmonoglutamic acid); biotin (D-biotin); vit. B12 (cyanocobalamin)]; pineapple aroma for the pineapple flavour; grapefruit aroma for the grapefruit flavour; beta-carotene – colour; sucralose – sweetener.